IWCS was the acronym for ”Integrated Wideband Communications System, “ the network that furnished the strategic and administration communication services for the entire southeast theater with access to the “world” mainly via Okinawa and Hawaii. The system consisted mostly of microwave and troposcatter links in Thailand, Vietnam, and Laos, (the principal site in Laos was the Vientiane to Udorn tropo shot. The Vientiane end was located in the USAID Na Hai Diao compound, adjacent to the ARMA/AIRA offices. 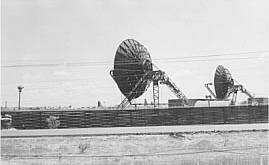 The antennas shown to the right were located at Udorn RTAFB. The system was built around the l961-l962 timeframe and was up and running by l966-l967. The system was operated and maintained by Philco, and later Page Communications, and then Federal Electric (FEC). One of the unused voice channels on the tropo shot to Vientiane had AFTN wired into it by the Udorn communications center. Part of that signal into Laos was fed into the ARMA/AIRA offices, into the Embassy offices and into a few private residences. The AFTN signal was fed into a button of the key telephone in Tom Morrison's office in Vientiane so that he could catch Sgt. Warman and others for the news every hour.